"Financial Freedom is about a lot more than money, it's about living a richer life." "Grant's genius is on full display in the entrepreneurial attitudes and strategies in this practical, fiercely focused book. Financial Freedom fills a major gap in Your Money or Your Life that I didn't even realize was there. Thank you!" "Simply put, this book will help you make money. You'll also learn to save, invest, and better manage your money--all good things! I hope you have the foresight to read and apply its many lessons." "Financial Freedom will transform your relationship with money." "Financial Freedom is a comprehensive guide to building tangible wealth that you can deploy immediately to give yourself real options in life. You'll both learn something and be inspired by Grant, whether you are brand new to the concept of financial freedom, or well on your way already." "Grant Sabatier is a bold, new voice for this country's next generation -- a generation that chafes at mounting debt, rejects traditional modes of work, and longs for financial freedom. In this comprehensive money manual, Sabatier blends deep wisdom with proven action steps. He shows how to mold your mindset so that you can make the most of your dollars and your hours. Best of all, he provides a blueprint so that you can build the rich life you've always wished for." "Eminently practical...A worthwhile purchase for anyone, not just aspiring millionaires, who feels overwhelmed by finances." "Financial Freedom changed my life. Reading it showed me a new way of looking at money and work that's opened my eyes to how life ought to be lived. Grant's book will not only guide you to financial freedom, it'll teach you to stop being limited by conventions and what you think you can and cannot achieve." 3.0 out of 5 starsMixed Review. Some good info, some dangerous advice. Podcast promo better than book. Overall, I give this book 3 out of 5 stars. While there were definitely some useful and helpful ideas, there was also some dangerous and flat out terrible advice. Overall, the podcast appearances promoting the book and the information discussed on those podcasts was much more impactful than the book itself in my opinion. - Limited discussion until the end of the book (p. 290) about Sequence of Return Risk. This is something few people understand and it is flat out dangerous to lead someone to potentially believe that they can retire decades earlier than "standard/normal retirement age" with significantly less money than they would supposedly otherwise need to accumulate by age 65, immediately starting withdrawing from these funds, and that their money will likely double, triple, or quadruple by the time they're much older. Yes, this is possible IF someone can remain flexible (on taking withdrawals from their assets, on generating income in "retirement"), IF someone has alternate income sources, IF market conditions are generally favorable during at least the first decade of "retirement," etc., but there is a major risk here as well. The author does mention these items and does provide a few cautionary words, but I do not think this was stressed enough for the average reader to truly understand the complete impact/considerations. I feel like most people will think, "oh, awesome, I can retire in my 30s with $1.25M, starting taking withdrawals right away, never run out of money, and my portfolio will be worth multiples of the $1.25M in my later years." More time should be spent discussing sequence of return risk. - Asset Allocation Metrics Are Questionable: p.235 suggests only a 5% international allocation. For most investors, especially younger ones with likely higher risk tolerances, this is unnecessarily low. - Qualified Dividends Categorization: p. 252 suggests that whether or not dividends are qualified (versus ordinary) is based on the length of time a stock is held. Not true. - Holding Bonds/Fixed Income in Taxable Accounts: p. 254 says [...] you will keep your tax burden as low as possible at the end of each year, since bonds typically have lower returns than stocks." Really?!? Bonds income is taxed as ordinary income. Why would you voluntarily hold bonds in a taxable account and pay ordinary income taxes? Anyone who knows anything about financial planning knows that, generally speaking, it makes sense to hold growth-oriented investments, like stocks, in a taxable brokerage account (due to more favorable taxation) and fixed income investments like bonds in tax-deferred plans (since bonds are taxed at ordinary income and all funds coming out of pre-tax plans are going to be taxed at ordinary income tax rates anyway). It's not just about returns from the standpoint of capital appreciation, but total returns, which include dividend income, interest income, etc. While stocks may increase in value faster than/more than stocks over a long period of time, that does NOT mean you should hold bonds in a taxable account! - Bonds vs. Bond Funds: p. 289 says "One nice feature of bonds is that you know exactly how your bond investments will grow each year, so the income is guaranteed." Is it? No, no it's not at all - especially if you're using bond FUNDS like the author suggests. If you hold an actual bond to maturity, it works slightly differently. Either way, that bond income is not "guaranteed." I think the author means well and I think his story of going from dead broke to millionaire in 5 years is awesome. As he mentions, he did that with some sacrifices, including personal relationships. I wish he would have spend more time digging into this and its importance, as I feel like many people struggle with this. I think it's a great book for him to tell his story and what worked for him, but I think he should leave the financial advice to those that are much more familiar with how this stuff works. If you're looking for a similar book, but much better, I would recommend Set for Life by Scott Trench. For those interested in real estate, the section in this book on real estate is generally weak in my opinion. I agree with the author's position on putting less than 20% down in certain situations - his examples of why on this are right on. In general, though, I would suggest checking out BiggerPockets for in-depth real estate investing info. 147 people found this helpful. I devoured this book over the weekend. Grant does an incredible job with the “why” and the “how” of reaching financial independence. I believe he is going to impact a lot of lives with this book. 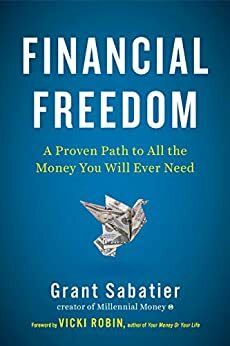 Financial Freedom by Grant Sabatier has woken me up from years of brainwashing by the status quo model of creating wealth. Grant not only shares his own experience of how he created financial independence early he provides the strategy and tools for me to do the same. As a full time single father, I consider this book to be the most important handbook to creating financial stability for myself and other parents or single adults. Thank you Grant. There’s some good advice in here, and interesting ways both to save and make money that are very helpful. Unfortunately, much of the tax information is wrong. Financial freedom is sometimes known as “early retirement”. However, since most early retirees keep working in some capacity, financial freedom is a better term. In order to do this, you need to be very focused, because your savings rate has to be 50% or higher to achieve freedom in a short period of time. Some people are able to do this, and that’s great. But many can’t. You also need favorable stock returns. I think there’s a reason that financial freedom is a recent phenomenon, and that’s due to the stock market’s performance since 2009. It’s obvious the author has only been investing during this long bull run. He pays lip service to market drops, but doesn’t understand how frightened people get when their net worth is suddenly half what it was six months ago. I personally have been working and investing through a couple of recessions – the tech boom and bust, and the recent Great Recession. Most people got nervous, went to cash, stopped contributing, etc., during these periods. The past investing decade has been really smooth. I’m not sure how everyone who achieved financial freedom will feel when we get back to more normal volatility. The author spends time on the importance of compounding early in the book, which is great. He makes a minor mistake, saying stock growth is called interest. Interest is paid on bonds. He explains how to arrive at your “number” – how much you need so you don’t have to work for the rest of your life. He knocks financial advisors for arriving at a specific number for retirement, which can’t be known in advance… yet here we are, calculating the number. He also mentions that this should be recalculated as you go, which is correct, and also what financial planners advise. Reducing your current lifestyle can result in a smaller number, which means you have to save less money. He gives good examples for how to do so. It’s a great point, to stay off the hedonic treadmill or get off it if you’re already there. The author also discusses about habits, which is usually necessary for success. Unfortunately, in so doing he gives a very bad piece of advice, which is to look at your net worth daily. Like I said, obviously he’s never invested through a recession. A disadvantage for an author who’s not in finance is that they probably haven’t seen a lot of research. And the research is clear. The more people look at their accounts, the more they trade, and the lower their return. I encourage absolutely no one to follow this particular piece of advice! However, it’s not a bad idea to look at your finances in terms of income and expenses daily. You have control of that to a large extent. You have no control over the market, and constantly monitoring that can prevent you from making good decisions. The book’s ideas about using your 9-to-5 as a launch pad are good. He recommends maximizing all the benefits you can get from your job, which will definitely help you save money. Also, use the day job to diversify skills, which makes it easier to side hustle. Take advantage of those conferences your manager send you to, so you can network and learn new things. He advises understanding what your actual hourly rate is, so when you’re making purchases you can think how much work you have to do to pay it off. Or how it will slow down reaching financial freedom. Invest early and often! Reducing the big costs – transportation, housing, food – has a big effect on lowering expenses and getting to freedom faster. He offers some interesting ideas on maximizing these options. It turns out that renting your place out (or a room out) is now called a house hack. The stock investing part is a mix of decent, traditional advice: low fees, diversify, remember a long term goal like retirement needs higher returns like stocks; and other well-known buy-and-hold type advice. Unfortunately this is mingled with incorrect statements and some bad examples and explanations. Comparing investing in a stock index fund to an advisor charging a fee on assets, using active funds, to claim that advisors cost too much is disingenuous at best. Many advisors I know use index funds, not active funds. Usually the cost of asset management starts dropping once you have $1 million as well. And yes, some people are perfectly fine investing by themselves. They’re logical enough when it comes to investments to make good decisions. But many people need financial advisors to help them avoid making bad decisions, like selling while the market’s down. I’ve talked enough clients off the ledge to know. The author is opposed to charging a fee for assets under management (AUM). For a lot of beginning investors, AUM doesn’t work because they don’t have enough in assets. He makes the point that the manager will make money even if the assets go down. True. But the manager’s incentives are lined up with yours: the more your money grows, the more they get paid. That’s not necessarily the case with other way that fees are charged. I’m not endorsing AUM over other methods! The industry is moving toward other ways of charging money. However, there are investors who really benefit from a manager who charges on AUM. He gets dividend taxation wrong. His explanation doesn’t make a lot of sense, but he seems to be saying that you’re taxed on withdrawal. It doesn’t matter how you take the dividend – in stock, reinvested, cash, whatever. The dividend is distributed to you and so you are taxed on it in the year you receive it. It doesn’t matter what you do with it. He recommends leveraged munis, for what reason I cannot fathom. Also, munis are only useful in taxable accounts, and mostly useful for those in high tax brackets. Speaking of bonds, the author recommends steadily high-returning bonds. Huh? If you’re getting a high return, they’re probably high-yield bonds, so they don’t protect you against market drops like bonds with lower returns do. There’s a lot of discussion in the book about how much you could take out in capital gains if you’re married filing jointly (MFJ), and I could not figure out what he was talking about. I finally realized that he didn’t understand the capital gains tax table. Your capital gains tax rate depends on your ordinary income. In other words, the tax table shows what the capital gain tax is according to your income. Up to $77,000 or so the cap gains tax rate is zero, for a couple who’s MFJ. The author seems to think that you can take $77k of cap gains per year without any tax, and then you can take however much in rental income (or other income) on top. That’s not the way it works. His discussion of taxable accounts isn’t wrong, but it is a little…slippery. He claims you get taxed twice on these accounts. True, you contribute after-tax income, and when you sell, there is tax. But you’re only taxed on the gains, not what you contributed, and it’s taxed at the capital gains rate which is lower than ordinary income. The book’s real estate section is provides good advice in how to find a good investment property, what to look for in a property, buying only what you can afford and not what the mortgage broker tells you, etc. However, it is wrong when it comes to taxes. The author doesn’t understand the new tax bill, which had a significant effect on mortgage interest deduction. The standard deduction was raised, but the mortgage interest deduction is an itemized deduction. You can take either the standard deduction, or you can itemize. You cannot do both, as he implies you can in the book. This would be a better book if the author ran it by someone who knows about taxes, like an accountant or financial planner. But other than that, I found good tips in here. So I think, overall, the message is actually pretty helpful. Even if you’re at an age where that early retirement ship has sailed, you might still get some good ideas for making more money and reducing expenses. The author discusses how good habits, executed consistently, will get you to where you want to go. Most of the habits, with the one huge exception of checking your net worth daily, are good ones to adopt. I usually don't take the time to write a review and this particular case wanted to do it; although, I'm not done reading. What like about this book is that is not only about how to manage personal finance. It's also about challenging they way people think about money and how make money. In today's society people won't get ahead by just following a money management plan, but by mastering it and increasing income. This a great guide to define what this means for you and how to go about it. Very easy to read book!